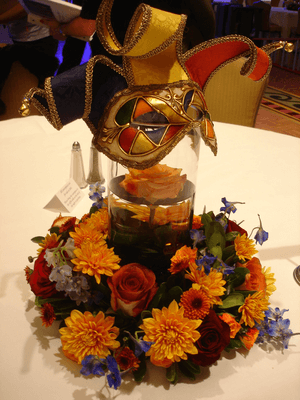 At a nonprofit auction, the Venetian masks made for a lovely auction centerpiece. Venice is one of the most popular auction themes I see. Maybe it’s the city’s canals, its Carnival, or just the Italian culture in general that seems to capture our imaginations. At every Venice-themed auction I’ve worked, masks have been incorporated into the decor. At this fundraiser, the masks had a predominant role in the auction centerpieces. Each centerpiece showcased lovely half-masks. Many of the masks on display elsewhere were full-face models, usually larger and more extravagant with feathers or other material. The centerpiece masks were half-masks, but still made of quality materials with rich color. They were uniform in color and size. The nonprofit opted to sell each for $60. Although guests were buying a lovely flower-mask-vase combination, let’s be honest … the draw was the mask! They were less interested in the fresh flower ring and lovely vase encircling the mask. Candles were not part of the centerpiece arrangement. I’ve no idea how flammable masks are, but I’m sure that was part of the concern. Instead of a candle floating in the vase, it was a large rose. If you’ll be relying on candlelight to supplement your lighting during the dinner, keep that in mind. One option could be to use a “fake” candle or LED light, though I think the design would need to be reworked in order to maintain the elegance. Dropping a waterproof LED into this vase might cheapen the look.